Liebherr shapes its global, local and regional spare parts distribution and logistics to support its rapid growth and exceed customer-service expectations around the world. Several positive developments that have a strong impact in the fulfilment and distribution of earthmoving Liebherr spare parts globally and within the United States have been announced in the last months by the Liebherr Group. 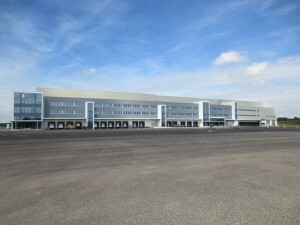 In October of this year, the Liebherr Group gave a glimpse into the progress of its new spare parts and logistics center in Kirchdorf, Germany. The new facility to begin operations in early 2015, is expected to serve as its global logistics hub for earthmoving spare parts. The investment value for the first stage of construction is in excess of $143 million and covers an area in excess of 505,000 sq. ft. A large part of the investment has gone into implementing highly automated warehouse equipment and software that will enable the logistics center to employ leading-edge performance standards. The new warehouse solutions will allow the group to handle higher volumes of spare parts, reduce turn-around times and guarantee order accuracy for Liebherr customers around the world. Additionally, the Liebherr Group is continuing a significant investment in building improvements, machinery, tools and infrastructure to expand the factory and enhance the warehouse facility at its Newport News, Va., location. These renovations are part of the $45.4 million investment as announced earlier this year by Liebherr Mining Equipment Newport News Co. The Newport News location serves as the headquarters and central warehouse for the Liebherr Mining Division and for four other operating Liebherr companies; Liebherr Construction Equipment Company among one them. Major warehouse overhauls include; the implementation of a sophisticated warehouse management system (WMS) and wide range of process-improvement initiatives consisting of a new racking system adding additional locations and increased load-bearing capability, more than 100,000 sq. ft. of new epoxy floor to facilitate the heavy traffic and movement of material, and eight new additional loading docks to speed up the traffic and help with the flow of trucks loading and unloading materials at the facility. “The new WMS offers a multitude of functions that will optimize the overall logistics and support the daily operations of the facility. It will provide a transparent work flow and enhance the visibility of the activities at each of the warehouse terminals; from receiving thru shipping, in addition to providing inventory accuracy,” said Martin Seitz, WMS project coordinator at Liebherr Mining Equipment Co.
Liebherr Construction Equipment Co. also announced the opening of a new spare parts facility located in Visalia, Calif. The new depot is expected to begin operations in early 2015. The facility will support western U.S. distribution with localized parts warehousing. The National Parts Distribution Center in Newport News, Va., along with its new distribution center in California, will help expedite parts orders, improve operational efficiency and minimize transit time while increasing customer support.